This year, over 3.9 million individuals cast a ballot in Georgia’s gubernatorial election. By comparison, only 2.5 million individuals voted in 2014 and 2.4 million in 2010. Georgia’s total voter turnout this year was 55 percent, nearly 17 percentage points higher than 2014 and 14 percentage points greater than 2010. In 2018, the turnout totals rivaled prior presidential election years. In 2016, more than 59 percent of registered voters—or about 4 million—cast a ballot in Georgia, with similar numbers in 2012. 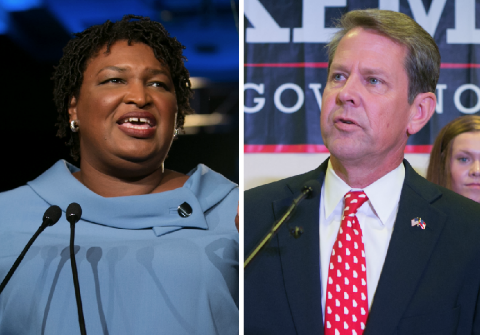 Abrams was a prime beneficiary of this surge in turnout, capturing more votes than any Democrat running statewide since 2008. Her 1.9 million vote total exceeded Hillary Clinton’s 2016 performance by 34,000 votes and outpaced the Democratic Party’s 2014 nominee for governor by 800,000 votes. Demographic-based turnout data are not yet available from the Georgia secretary of state’s office, but exit polls indicate African-American turnout was comparable to previous years. In 2018, 30 percent of Georgia’s electorate was African American, while 60 percent was Caucasian. Those numbers were the same for the 2016 presidential election. Similarly, in 2014, 29 percent of total voters were African American and 64 percent were Caucasian. Abrams’s claim that Kemp used the secretary of state’s office to purge voters from the rolls "wrongly" does not stand up to scrutiny. While Abrams has been quick to mention that 1.5 million people have been removed from state rolls since 2012, she has failed to distinguish that those were "inactive" voters. For one to become inactive they must not vote for three years and fail to respond to outreach attempts by the secretary of state’s office. Abrams also fails to note that the number of total voters has consistently increased since 1998 when Georgia first started purging inactive voters from its rolls. In the two years between November 2016 and November 2018 alone, the state added more than 985,000 active voters, while shedding more than 687,000 inactive ones. Republican state senator Joshua McKoon, who ran for secretary of state this year, told the Washington Free Beacon that removing inactive voters was essential to preserving the integrity of the election process. "One of the most important things to do if you’re going to have free and fair elections is to have confidence that your voter lists are accurate," McKoon said. "It’s the only way to know that only folks eligible to cast ballots are doing so." In June 2018, the Supreme Court determined in a 5-4 ruling that states were well within their rights to purge voter rolls. Likewise, Abrams’s claim that Kemp wrongfully put 53,000 voters "on hold" in an effort to prevent them from voting is deceptive. Georgia—like Florida, Ohio, and Wisconsin, among others—has an "exact match" law requiring personal information collected on voter registration applications to match data on file with the local department of motor vehicles and the federal Social Security Administration. The 53,000 individuals in questions were not purged from the rolls. Rather their voter registration status was placed as "pending" meaning more information was required to verify their identity. In most cases, "pending" status can easily be resolved by an individual either online or by contacting their local board of elections. As noted by both Kemp and the Georgia Republican Party, those with a "pending status" on Election Day are still allowed to vote either by regular ballot, upon providing proof of identification, or by provisional ballot, if identity was unverifiable. The Wall Street Journal observed that Abrams, herself, may hold some responsibility for the significant number of voters labeled with a "pending" status prior to the election. "The [exact match] law was intended to prevent groups from sloppily filling out applications for individuals, as Ms. Abrams’s New Georgia Project appears to have done," the paper’s editorial board wrote. Abrams founded the New Georgia Project in 2013 to register voters across the state. It is unclear how many voters registered by the group fell into the "pending" category. Neither Abrams nor the New Georgia Project returned requests for comment. Benita Dodd, vice president of the Georgia Public Policy Foundation, told the Washington Free Beacon a large number of "pending votes" were the result of "outside groups signing up people to vote using paper registration forms" instead of urging them to register online. "Paper registration forms are notorious for causing inaccuracies either because of illegible handwriting or transcribing errors when data is input into the system," Dodd said. Although Abrams correctly points out many polling places have closed throughout Georgia in recent years as election officials consolidate precincts, she is wrong as to where the blame lies. In recent years, rural counties, many still laboring under diminished tax bases as a result of the recession, have seized opportunities to save tax dollars wherever possible. This has been no truer than when it comes to administering elections, especially with the implementation of early voting. "Consolidating polling places is a natural consequence of early voting," McKoon said. "It is unbelievably dishonest to suggest Kemp had anything to do with these polling places closing." Furthermore, the majority of the precinct closures occurred in areas that voted for President Donald Trump in 2016, suggesting precinct closures were more common in Republican counties. Despite joining Abrams in urging rural counties to keep polling locations open throughout the race, Kemp has been blamed for a situation that was largely beyond his control. In Georgia, the state does not monitor the closing of polling places—determinations about closing precincts are made at the county level—and the secretary of state’s office was unaware of the number of eliminated precincts as of August. "These were decisions made by local elected officials in local counties across the states," McKoon said. "Regardless, the secretary of state doesn’t have the constitutional power to keep polling places open." Even though there is plenty of evidence to the contrary, Abrams has continued to denounce the specter of voter suppression. On Tuesday, a group backed by the Democrat filed a lawsuit against the Georgia secretary of state’s office, accusing it of "gross mismanagement" of the 2018 elections. McKoon suggested such tactics could have been more about political posturing than anything else. "I do think it is fascinating that Stacey Abrams would file this lawsuit and launch this new organization—it looks as though she’ll be able to make being a sore loser into a full-time occupation," he said. This entry was posted in Politics and tagged 2018 Election, Brian Kemp, Georgia, Governor, Stacey Abrams, Voter Fraud. Bookmark the permalink.